Francesca James is the co-founder of the NatWest Great British Entrepreneur Awards. 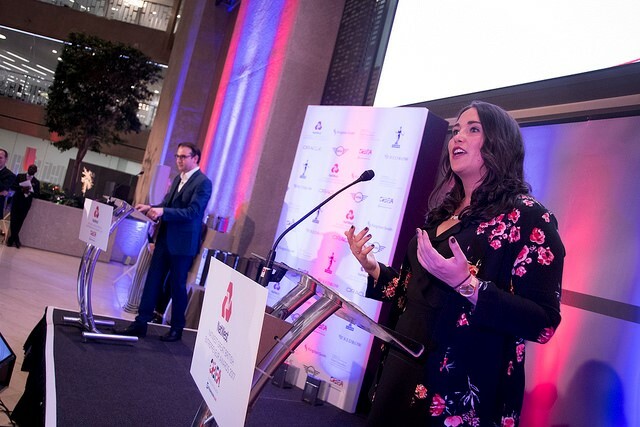 Hailed as the benchmark for entrepreneurial success, the NatWest Great British Entrepreneur Awards is more than simply an awards evening and is quickly becoming a vehicle on a mission to unite some incredible business minds and make valuable and purposeful connections. Fran takes 5 minutes with Cardiff Times to talk about her recent business move, the emerging Welsh entrepreneur scene and her expansive career. What motivated the business move from London to Cardiff? I’m from Cardiff and after a brief stint in London I returned for a weekend and never left again. I fell back in love with the city, it’s changed so much in the last 10 years and I think it’s a brilliant place to live and work. Once I’d made that personal choice, we started exploring the possibility of moving the business. Over 3 years, we gradually moved jobs from London to Cardiff and we were encouraged along the way by two really important factors; office space and fantastic talent. We’ve a great office in the centre of town with a roof garden and lots of space and we’ve really made it our own. In London, the same financial outlay would barely get us a shoe box. In terms of people, we’ve recruited and built an incredibly talented young team. At 30 I’m not far off the eldest! We’re able to offer quite unique opportunities to those who want to work on projects that would usually be limited to a career in London. We give lots of responsibility to our team from the offset, it’s served us well and they rise to the challenge and thrive. I’ve been really impressed with the talent pool in Cardiff and it was absolutely the right decision for us. How do you think the Welsh entrepreneurial scene is emerging? It’s thriving, and businesses are choosing Wales to start or relocate attracted by access to devolved decision-makers, skilled local labour and lower operating costs. Wales has a unique proposition for those looking to start and grow a business; we’ve a growing tech scene, access to top talent, properties that enable businesses to grow and also a great quality of life for business owners and their teams. We had several Welsh winners picking up national prizes at the Great British Entrepreneur Awards this year and it was fabulous to see some of the silverware so to speak being brought home. Our overall winners were Spectrum Collections, they beat off stiff competition from all across Great Britain and are a shining example of the potential, talent and success coming out of Wales. Sisters Sophie and Hannah Pycroft started a business in their garage in Barry – it’s now worth around £8 million. They sell their multi-coloured brushes and brush sets all over the world after they became a hit on Instagram. It was a real privilege to see the overall national recognition going to entrepreneurs from down the road! You’ve had an expansive career, what have been the lowest and highest points this far? Oh that’s a tough one. I ended up going to university quite late on because I thought it was my only option, but now I’d certainly advocate to others to select the path that’s best for them whether that’s apprenticeships, university or business. I ended up where I am after a long and winding path trying to figure out what I wanted to do. I spent 2 years doing door to door sales on 100% commission – being in the valleys, with the rain coming down sideways, knowing you’ve spent more money getting there on the train than you’ve earned – that was what you could call a low point. However, I think you can learn from every challenge in life and it certainly taught me a lot about myself. Highest point? That’s easy. Earlier this year we had the launch event for the NatWest great British Entrepreneur Awards 2018. I was blown away when I stepped back and took stock of what we had achieved. We had so many wonderful comments from judges and applicants saying how much they enjoyed the programme and how rewarding it is to be a part of, from a personal and business point of view. When someone tells you they secured investment as a direct result of being associated with something you’ve created and built, that’s quite special. Any advice for future Welsh entrepreneurs? Starting a business can be exhilarating, rewarding and fun, but can be exhausting, relentless and stressful in equal measure. Just like any endeavour, taking advice from those who have already made mistakes and achieved their own successes despite setbacks is a sure fire way to minimise the risks of lessons being learnt the hard way.